Had a shower come through this morning and it cooled it down for a little while. It is only 88 degrees right now and it’s 12:30 p.m. Unfortunately, expect to see 100 degree temperatures through the first half of the week, then upper 90s….not much difference! Yes, the generators have been off every morning since Thursday. The only day they started running earlier than their projection was Friday when they started up the generators at 11:00 a.m. instead of the projected 1:00 p.m.
Stan on the river Thursday morning with Silas and Ted. Good morning on the copper dun midge and stripping the flasher (this is similar to a crackleback, but is tied with olive midge flashabou). With the water off, they pretty much fish from just above the Rocking Chair area to just a little below the MDC boat ramp. Friday there were lots of us on the water. Darrell had Baxter and Jim from Oklahoma out for half a day. Not only did they boat several trout, they also landed 3 white bass on the copper headed zebra midge. Chuck, from Arkansas, spent the morning with Stan. He had a good day stripping the flasher. Once the water came on, they switched to the big ruby with a #16 red midge dropper and caught some more drifting down to the MDC boat ramp. Jim had Carl and Paul, from Ohio, out. Carl had fished with Jim before, but this was new for Paul. They did well on the black zebra midge, a gray scud and size 8 and 12 jailhouse bugeye buggers. This was Trish and Mike’s last half day before heading back home to Texas. This was Mike’s day. Trish out fished him Monday and Wednesday, so Friday was his day..not by too mush though. 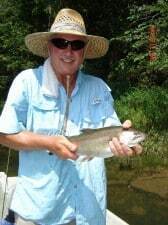 He did boat a 19-1/2 inch and a 17-1/2 inch rainbow among his morning’s catch. Before the generators came on, stripping the 56er on a sinking leader was the ticket. After horns, the red San Juan worm dropped uner a white caddis larva was the ticket. Darrell on the water Sunday morning with John and Jacob, from Springfield, Mo. they caught fish all morning on the copper headed zebra. Jim and Brad from Clinton, MO. had a good morning with Jim. Brad is new and needed a little instruction, but they started catching on the copper dun midge, holographic green crackleback and size 12 jailhouse bug eye bugger. And HAPPY BIRTHDAY to BOBBI. 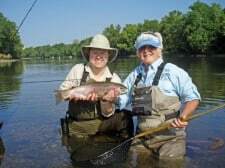 To help her celebrate her birthday, Gina and a surprise appearance from Valley of Oklahoma, took Bobbi fishing for two days. 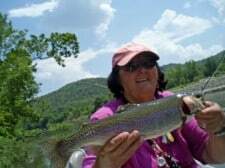 The fish gods were watching over Bobbi has she landed a beautiful 24 inch rainbow on the olive floozie. I kept hearing her saying, “this is one of the best birthdays I can remember!” Think the ladies had a great time and caught a lot of fish stripping the olive floozie, pine squirrel sculpin, 56er, olive buggers and who know what else! Valley had a pretty good day too. She is quickly becoming a “stripper”. 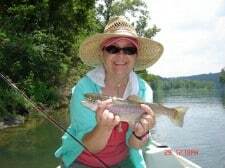 This entry was posted on Sunday, July 31st, 2011 at 5:29 pm	and is filed under Fishing Reports. You can follow any responses to this entry through the RSS 2.0 feed. You can leave a response, or trackback from your own site.